Blogger Template - Soho v2 Responsive Blogger template is a neat and clean design template, giving an elegant feel. The Soho v2 Responsive template This Blogger template provides a new atmosphere, easier to navigate, more comfortable to see. This template is a template redesigned from the default blogger template Soho, for this v2 it looks very minimalist with slightly different colors and fonts. The feature also adds a grid style that doesn't change. Please note that it is very good to display a gallery of photos and articles in this template. The default white color of Soho V2 is very Responsive and Mobile Friendly. 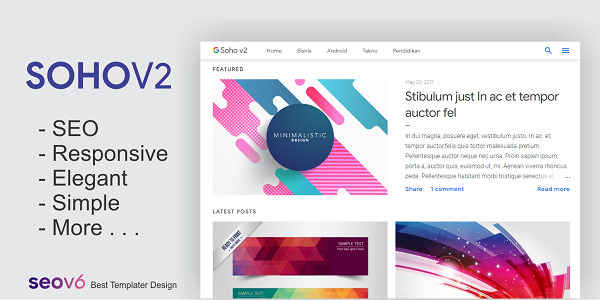 For the following features of the Soho V2 Responsive Blogger Template. The header feature in Design is simpler than before where in desktop mode the page list is parallel to the blog title, making the header form very simple and not having a lot of free space. Copyright copyright has been encrypted, don't delete it from time to time! if deleted it will automatically go to this delevoper template homepage.